When faced with a crisis situation for my elderly father, and after dozens of phone calls seeking help, The Lodge at Mallard’s Landing was a direct gift from God for me. They immediately responded and assisted me in obtaining him respite care. From Samantha S. To Gail D. And Steve to the waitstaff in the dining room they have been not only exemplary but incredibly helpful and comforting to not only my father, but to me. I’m certain there are numerous options for assisted living elsewhere, but I would NEVER go anywhere else first. I am beyond grateful and sincere in giving this facility and their staff the highest possible recommendation. The Lodge at Mallard's Landing has a workout room, a movie theater, a pool room, puzzles, and crafts. They provide three meals a day, and they'll do towels and sheets. The staff is awesome, and all of them are wonderful. My mother, 83 years, was living alone in a large house. She is independent, and didn't want to leave her home of 30 years. We, her family, were concerned that because she is a high fall risk, felt her living conditions were unsafe. She steadfastly refused to consider moving to an independent living/active adult community, until we convinced her to visit The Lodge at Mallard's Landing. What originally was going to be a short (two-week stay, while my family and I were out of town), ended up becoming her permanent residence. My mother moved into The Lodge in August, 2016. She has now lived there for half a year, and loves it. Because she no longer drives, she was isolated in her former home, and completely dependent on others (family, friends) for shopping, entertainment, etc. She now has an active social life, has made many new friends, is eating better and regularly, and is essentially a "new" person! We talk to her daily, but no longer worry if we aren't able to see her on a daily basis. We know she is safe and happy. I recently visited my grandmother there and came across the new woman that is the head of the place. She came across very cold and walked around with a stern look on her face. I'd talked to a few residents my grandmother sits with, and they told me all of the "treats" and fun things that aren't allowed anymore because it's being run more like a business. The dining staff however did an excellent job and were very kind and courteous and the nursing staff takes wonderful care of my grandma as well. I just wish it went back to how it was when she first moved in, a happy, joyful place where everyone could enjoy themselves and have fun, (even staff while they're working). Maybe with someone new in charge could possibly help change that back. This is their home, not a cold, dark, unenjoyable place with no laughter allowed. Dear kathy682, Thank you for taking the time to post a review and share your feedback with us. We are very pleased to hear your comments regarding our dining services program and wonderful care of your grandmother. Our goal is for every Resident, family member and guest to feel like they are getting excellent customer service in all areas, and it sounds like we may have fallen short on your last visit to our Community. Please know that we do not take comments lightly and all reviews are discussed with our teams on-site as well as our regional supervisor. We expect that you will have a different and enjoyable experience with our management team on your next visit. The Lodge at Mallard's Landing was very nice. It had all three levels of care like independent, assisted, and memory care. It was very clean, and the grounds were beautiful. The only drawback I had with the lodge was that it was way too expensive. It was more of like a business-run thing. It was larger, and everything was further away like the cafeteria and the dining room, but it was all fine and had easy access. The staff was good and kind. The Lodge at Mallard's Landing is very attractive and good looking. They also have a nice-looking dining room. I have no idea what the food would be but the prices seemed like they would have been OK. The staff was very friendly. The place was just off the freeway. I saw two rooms that were nothing special, but they were clean and one of them had been redone, so they're trying to keep up the building. Dear LanaXWHLL, Thank you for your nice comments regarding our staff and cleanliness. We are happy you felt the friendliness of our Community team, and noticed our cleanliness as well. We will be sure and share your feedback with our team who takes pride in their work. We are sorry to hear you did not stay for a meal with us. We hope you come back for a tour and enjoy a meal next time. We are proud of our menu selection and would love to serve you a meal in our lovely dining room. You are correct, we are located just off Hwy 16 and Wollochet Drive, behind Mallard's Landing Business Park and next to Adam Tallman nature trail. The assisted living at The Lodge at Mallard's Landing was nice. The rooms were not too big but bigger than what we were expecting. The staff seemed very nice, too. I recently assisted a family member find senior living accommodations. Our experience at the Lodge was five stars. Jen and other staff members were so helpful during the entire process. Jen Drake at The Lodge at Mallard's Landing made all the difference in my folks decision to move to the Community. She was so upbeat and patient, answering all of our questions and making sure we had a good experience. When it came time to coordinate the actual moviein, she was there with a smile and helped my folks get settled, even coordinating with our moving company. No other neighborhoods compared as well to this one and Jen was a standout reason! I have had peace of mind since I moved my Mom into the Lodge at Mallard's Landing earlier this year. There have been the usual bumps that come with moving a parent but Jen Drake and other staff members have striven to ensure that the transition is successful. I moved my mother into the Lodge last February and since that date, I have had nothing but positive experience with the staff at the Facility. Jenn was great in assisting us in getting my mom in a cottage which she loves. Jenn, was great with talking with my mom so that she understood which gave her piece of mind. The food has been wonderful, I actually try to have lunch with my mom once a week and enjoy the selection and good cooking. We actually had our Easter dinner at the Lodge this year. When I talk to people in the community about the Lodge, they also speak highly about the Lodge. Very poor care. I also talked to a lady named Jerry about the facility she was so rude and short. She seemed put out that I was even talking to her. We will be taking my dad to a different facility. Thank you for taking the time to post a review on Caring.com We take feedback seriously and are disappointed that you did not receive a warm and friendly welcome at The Lodge. We take pride in our customer service, and the care we provide for our Residents. Our goal is a positive experience for all. We have reviewed your feedback with our team, and provided additional training on the welcome process and expectations for excellent customer service. We encourage you to come back and visit. Thanks again. I have always loved going to the Lodge for Gig Harbor Chamber and other social events. However recently I have been at the lodge for other business and have had the extreme pleasure of working with Jen. What an amazing asset she is tou your company. She is always pleasant and seems to always have a good word about everyone. I have seen Jen go out of her way to answer a question or help a resident without a thought. I like The Lodge of Mallard's Landing a lot for the level of care that a person needed. It's a smaller facility, thus offering a more personal level of care. They have dedicated staff to certain groups of people. I would recommend this facility the highest among the ones I've visited. It is a nice facility with a nice location. They have many places to walk around outside. They have a nice, green environment. The Lodge at Mallard's Landing is a beautiful assisted living community. Three family members and I toured the place twice and each time we were impressed at how well cared for and happy all of the residents seemed. Jen Drake, the community relations director, was very informative and empathetic to the needs of our loved one. Her 'can do' attitude and warm friendly manner made us feel right at home. The dining room is like a nice restaurant and the food is wonderful - fresh and tasty - some of the best food I've had anywhere in Gig Harbor. The Lodge at Mallard's Landing is a beautiful community. We had a full tour along with lunch, were able to ask a lot of questions and hear and view all of the amenities. Staying at The Lodge would be like living in a luxury hotel! All of the people we met seemed caring and friendly. The care that my mom receives from the employees of this facility is tremendous. Bob the CEO and Jen go out of their way to make sure that each resident is happy and treated with loving care. My mom speaks very highly of the man that cleans her room. The facility is very well maintained. All the employees know each and every resident by name and treat them like a family member. I tell people my mom is staying at a Hilton Hotel because of the treatment the residents receive. The Lodge at Mallard's Landing is a lovely, professional and happy place for my 92 year-old father to live since Mother died 4 years ago. He visited there many times and when it was time to move to an AL this was his first choice. He is not a social guy, so he does not take part in all the social activities they have, but he gets lots of company from the staff and residents when he goes down to eat and when they come to give him his meds and just check in on him. He enjoys the food, loves his apartment, and is well cared for by the entire staff. My dad has been in the memory care unit of The Lodge at Mallard Landing for 2 months now. I am very satisfied with the service and level of care my dad is receiving. I stop by a few times a week and always find the staff up-beat, caring and helpful. I'm impressed by their constant communication with the residents, encouraging discussions and activity with them. They treat each resident with respect and dignity regardless of their level of functionality. They promote interactivity by encouraging each resident to spend their time in the "community" room versus leaving them alone in their rooms. They have occasional, supervised outings along with weekly "happy hour". It is not unusual for a staff member to be playing a board game with a resident which helps keep them alert and thinking. The facility is clean, with a very comfortable, relaxing, home atmosphere. Most importantly, my dad enjoys it there. The Lodge at Mallard's Landing is a lovely facility and we are very happy with our "cottage". The staff and residents are friendly and we feel at home here. Housekeeping, maintenance, and transportation services make our lives hassle-free. Meals are generally good, with an occasional "dud" and an occasional "wow". Suggestions for improvement include: better response to community and resident use of facilities (including room reservation, set-up, posting of fees, parking availability); more effort to introduce new residents to staff and fellow residents and to inform new residents of how/when/where, etc. procedures for use of facilities and participation in events. Living out in the cottages, we sometimes feel ignored. Overall grade = B+. The Lodge is bright and friendly. It does NOT feel like a depressing retirement home. The staff is wonderful & personable. The nursing staff seems a bit cold & indifferent, however, I've noticed they have some new staff which seems much kinder. The parking is TERRIBLE inside and out. Stall are too narrow, & I've noticed the seniors are not able to park properly in the downstairs parking, & visitors have a hard time parking outside. *It would be wonderful for a lot of seniors to have little pea patches outside that they could garden in the warmer months. The Lodge at Mallard's Landing was in the same city where I lived in. Everything was perfect. The staff was very polite and accommodating. The rooms were beautiful. I would recommend them to others. The building and grounds of The Lodge at Mallards Landing are beautiful, but do not be deceived. In my experience the care is very poor. We had my wife's grandmother at The Lodge a couple of years ago and the care was good. We were very pleased. When I placed my dad there, I expected the same level of care. Boy was I wrong. The Lodge has apparently fallen on difficult financial times and they have substantially cut the skilled nursing care. It was my impression that young, untrained and inexperienced "med techs" provide most of the care. Long story short, lack of trained nursing assessment resulted with my dad spending days on end suffering needlessly. Even when he started missing meals, there was no read flag raised. 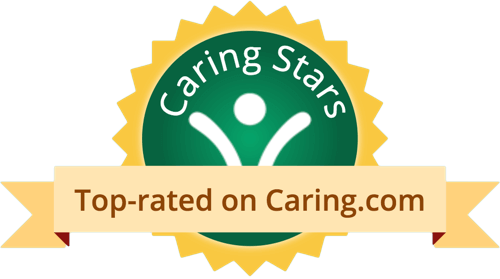 Thank you for taking the time to provide feedback on the Caring.com website. Communication with family is a top priority for The Lodge, as well as providing care and services that exceed all expectations. The Lodge has a full-time RN on staff who manages the assisted living and memory care programs. In addition, The Lodge receives nursing support and guidance from the corporate RN and management team. Monitoring our dining program, as well as daily meals is a standard operating procedure for The Lodge. The Reviews on this site, as well as feedback are not taken lightly, and will be reviewed with the Executive Director and management team. Thank you again. My sister is living in The Lodge at Mallard's Landing. It's a lovely place and I had a beautiful tour. The property is beautiful and well-kept. The staff is friendly and eager to help, including everyone from maintenance to the highest levels. The person in charge of the food actually comes out, sits down with the people, talks to them, and gets to know them. They make a very strong effort to be client-centered. The people there are very happy and I didn't talk to anybody who's unhappy. They have exercise programs, a theater, a billiards room, bible studies, exercise classes, and frequent outings on a really nice bus. They also have activities for people who like to do artsy things. Everything looks brand new. Thank you, David, for taking the time to review The Lodge. We are pleased to hear that you had such a positive experience when visiting our community! Our team is dedicated to providing resident-centered care, in every facet of the services we provide. We hope your sister will continue to be our resident for years to come, and we look forward to welcoming you upon future visits! My visit at The Lodge at Mallard’s Landing was pleasant. The rooms were a little dark, but they were nice. The dining room was good, although I have not eaten there. The thing I didn’t like is that they have some restrictions in regard to smoking. Dear KarenODJUL, We are happy to hear you enjoyed your visit at The Lodge. We have a variety of floor plans and apartment locations to meet a variety of Resident preferences for views, lighting, etc. We hope you visit us again, and please stay for a meal. Our dining services department is proud of our menu selection and meals, and would love to serve you. Like many senior communities, The Lodge is a non-smoking residence, however, we do have designated smoking areas. Thank you again for taking the time to post a review. We appreciate it! The Lodge at Mallard's Landing was nice but far away from a lot of stores and restaurants. They had cottages, but we didn't like them as much as the other place we saw. The rooms were really small. After looking at several facilities within the Gig Harbor area, we chose an independent living apartment at The Lodge at Mallard’s Landing for my mother-in-law three years ago. Because of our positive experience, we moved my mom from out-of-state into an assisted-living apartment a month ago. The Lodge is located in a quiet setting; both the building and grounds are beautifully kept. The dining room is open 12 hours daily, so the residents are able to choose their own meal times. House-made soups are always a top choice. All of the employees know each resident by name (and even us, the family members) and treat all of us like family. We have been extremely pleased with the desire of all of the aides to give the level of attention required by my mom in assisted living. We have also had opportunities to work with Linda, the chief administrator; Jen, the marketing director; Teresa and Michelle, the staff RNs; Jenn, the food director---and all have been very caring and supportive. We are impressed that the wait staff in the dining room learn the food preferences of each resident. The front desk personnel are always helpful and courteous. To find such a wonderful facility just five miles from our home is a tremendous blessing to our family. My parents moved into an Independent Living Cottage at the Lodge at Mallard's Landing in January. Shortly after my father had two strokes and didn't return to the Lodge for about two months. The day he was returning from rehab facilities, my mother (who has sever dementia had a bad fall that followed with months of hospitals and rehab. During the whole ordeal the Lodge Staff was very accommodating working with us to provide the best possible living situation for my father and family. Jen was outstanding with the help and understanding that she provided during that time. Perfect fit in Memory Care for my father. I started looking over a year ago and toured many other communities in the Gig Harbor and Tacoma areas multiple times. I kept coming back to The Lodge for Memory Care. The pros are many: nice rooms and public “lodge-like” spaces, patios, good food, regular activities, and easy access for family. While the pricing between communities was similar, the care team and staff at The Lodge made the final decision easy. Everyone has been extremely helpful in making a potentially difficult transition seamless for my father. Dad is enjoying his new home and routine. Whatever level of care you are seeking for yourself or a loved one, I highly recommend considering The Lodge at Mallard’s Landing. 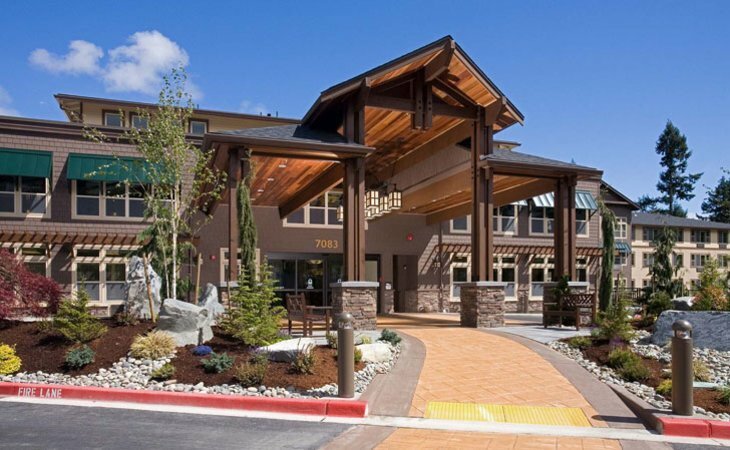 Premier retirement and assisted living community with independent living cottages located in picturesque Gig Harbor, Washington. Nestled in the spectacular Puget Sound region, with award winning medical facilities within a few miles, and a variety of cultural and shopping experiences available, you'll find that The Lodge at Mallard's Landing offers you an exceptional choice for retirement living in Gig Harbor, Washington. Our apartments feature beautiful designer finishes, Corian countertops in the kitchen, walk-in showers and a variety of views and floor plans to choose from. What should caregivers and potential residents know about The Lodge at Mallard's Landing?